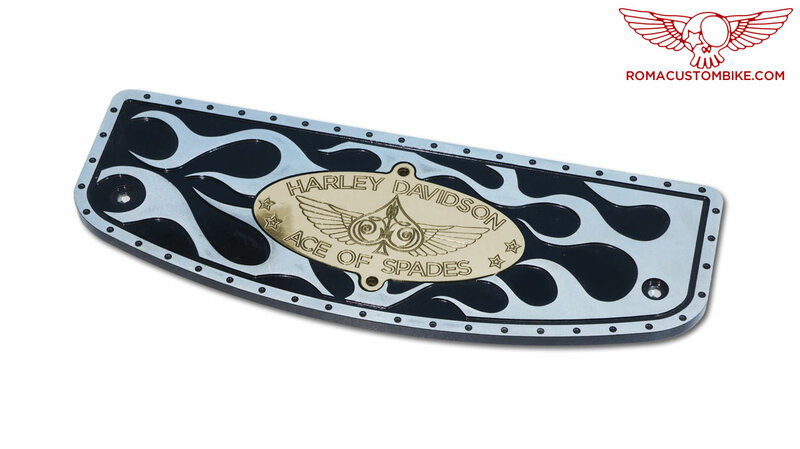 A great way to truly customize your ride and make it your own, no-clip ons here! 1986 - 2015 SOFTAIL MODELS LIKE FLSTC, FLSTN, FLSTF & FLSTS THAT HAVE THE STANDARD D - SHAPED FLOORBOARDS. 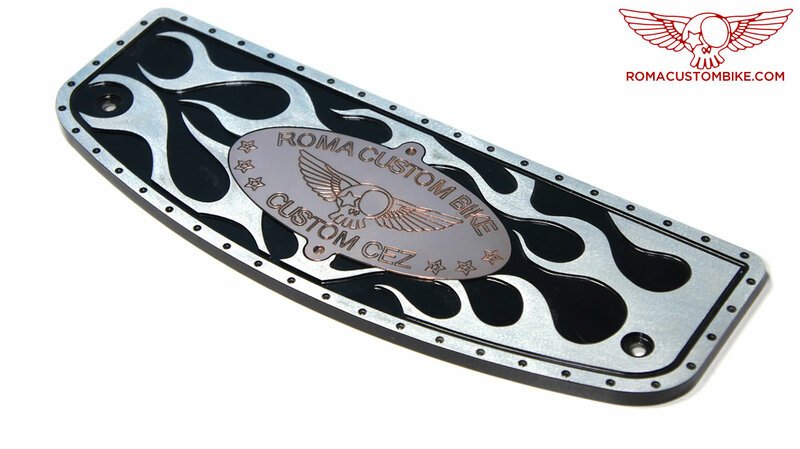 The combination of different metals, powder coating paint and a custom design developed for each client, make this accessory absolutely unique to your bike. In the "Material" category choose between the COPPER or BRASS insert to match your style. 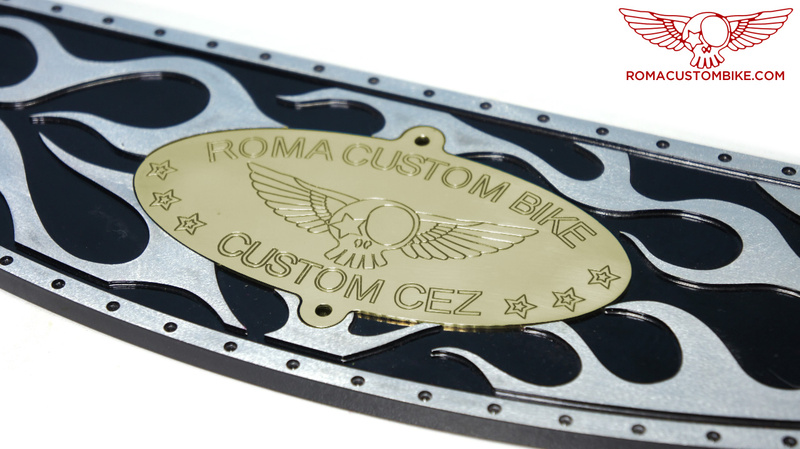 The "Standard" medallion in engraved with the Roma Custom Bike logo like in the picture. your name, your logo, your MC patch, what ever your hart desires. These motorcycle foot boards are carved out of a solid piece of aluminum, then powder coated for maximum protection. 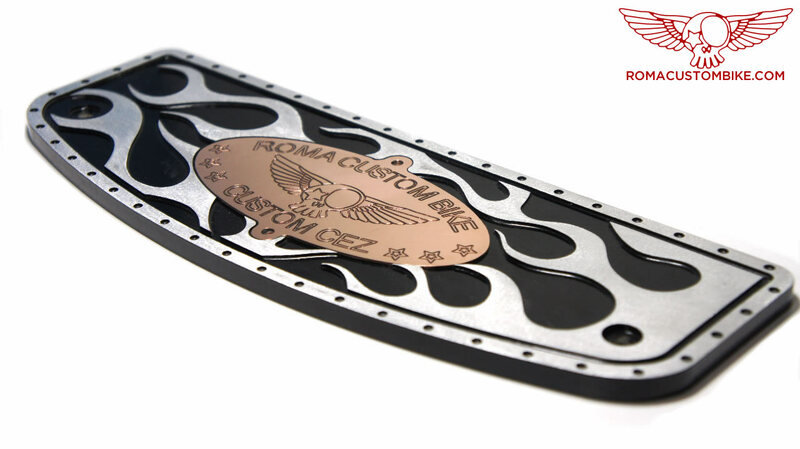 They are than hand sanded to bring back to the surface the shine of the aluminum for a contrast cut effect. The medallion is designed according to the submitted drawing, carved and than hand varnished to perfection. We can also develop one-off designs and color schemes, contact us for more information. 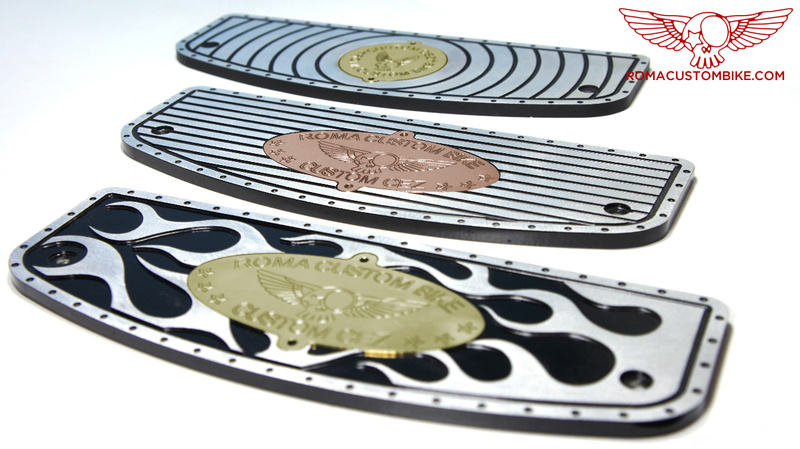 The design inside of the medallions entirely UP TO YOU! Send us a vector drawing of the design you want to incorporate and we'll engrave it onto your part. Download HERE a .zip file containing the the files for your design (.dxf, .ai, .jpg). 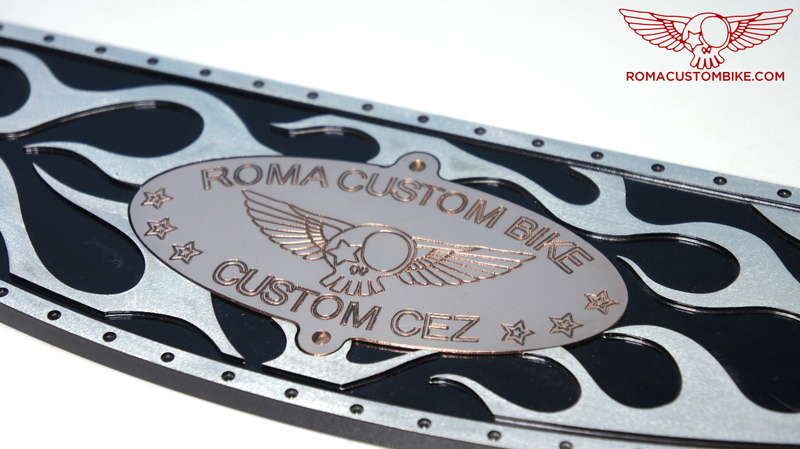 You can send your files to info@romacustombike.com. Optional service: If you don't know how to make a vector drawing or you don't have a logo or you just want for Custom Cez to design something just for you, contact us and we'll take good care of you (additional cost starting at 30E). In the mean time you can use this picture to doodle your design. 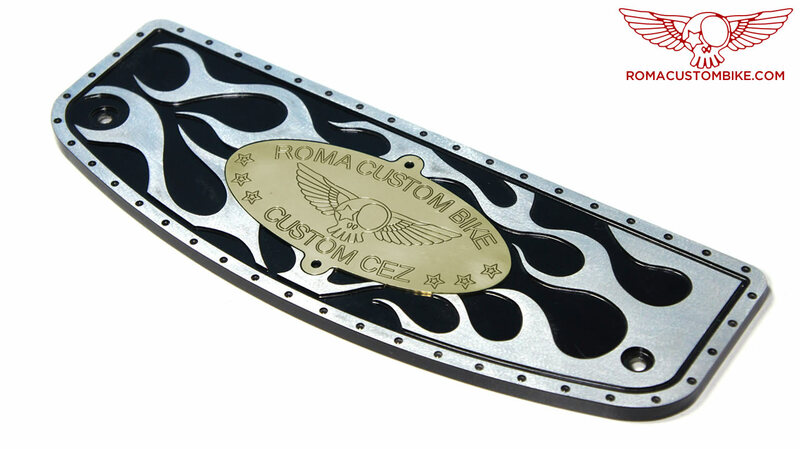 Use the oval template for the Flame model, we have left the Roma Custom Bike logos to give you some idea of the spacing and size of the logo and lettering. Keep the design within the safe area lines. Before purchasing make sure you have selected all the right options. CUSTOM version (+60E +tax) where we'll engrave you own logo right on the medallion. GUNS medallion with the guns design. ACE OF SPADES medallion with ace of spades design. Do you want your own design on the medallion of your custom accessories but don't want to prepare your design? Design services for the custom accessories. Buy the t-shirt, support the show!